Evolutionary shooter that creates an involving, sometimes terrifying, tactical battle between two distinct races. Brilliant. 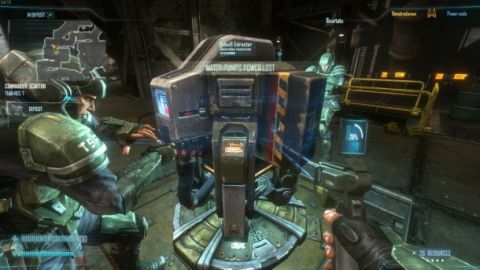 It's taken almost a decade for the Natural Selection 2 developers to bond an FPS to an RTS and make it work. The original mod was fun, but this sequel is a wonderful one-off, where asymmetrical teams fight on the ground while a commander prompts and preps from above. And although 90% of its audience will be buying it for the shooter, like the rug in The Big Lebowski it's the RTS that ties it all together. It would be easy for each side's commander to just be a spambot for the grunts on the ground, but the relationship is truly symbiotic. The whole point is to protect this person – a soldier who volunteers from the usual sci-fi castes of human and aliens at the start of the game. They disappear into their command module and then the orders start coming down. While trying to destroy the command module of the other team, you must spread your race's structures through the level to gather resources. The commander chooses what to place and where it goes, but it takes the grunts to make it happen. The commander on the marine side asks for tech to be built so he can both protect himself and upgrade marine weaponry. On the alien side he doesn't need his troops to build things for him, but to protect his infestation as it spreads in an awful, dynamic gloop across all surfaces. The reward for everyone is toys. Everyone collects resources that go into a pool. The commander spends these to research upgrades that the players buy. For the marines that's shotguns, flamethrowers, jetpacks and exoskeletons, all of them slick and well-animated. But you can stick with the basic rifle combo if you choose: it does the job. For the aliens, the upgrades are more fundamental. Aliens start off as Skulks, wonderful speedy little wallcrawlers that are the perfect ambush class. They skitter about in the vents and leap out of corners. If you choose to evolve, you'll need ever-increasing amounts of resources to hop into the bodies of the Gorge (support), Lerk (aerial combat), Fade (stealth death machine), and Onos (RARRRGH!). Each of these can be modified with perks, but these must be researched by the commander first. It's an interesting feedback loop to be part of, creating an easy, instant alliance. Most people will have an affinity with the marines, and my own favourite battles have been when the aliens have nibbled on a power node and plunged my area into darkness. The ten seconds where you spin around with your torch, waiting for the back-up generator to kick in, are terrifying. If the surrounding aliens haven't muffled their footsteps, there's a scuttling, clacking noise as they close in. But then the flipside of playing as a Skulk, watching from a vent as a passing squad hunts you down, is equally nervy. When all this comes together the results are not unlike an action-RTS: nothing is just given, and every resource point is a battle. The matches are long slogs, some stretching to a tense 45 minutes, but the smaller fights tend to be over quickly, with one team drawing back to regroup as the other repairs whatever damage was done.